A century ago, “Seattle’s Heart,” the Pike Place Market, was created in a joyful conspiracy of families and farmers. 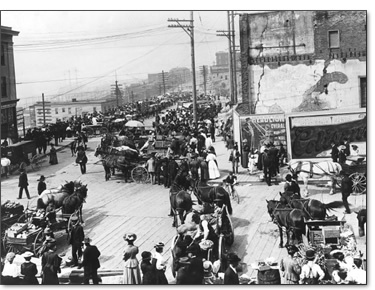 Growers and shoppers first conducted business from the backs of farmers’ wagons, but soon the market required more permanent housing, moving to the covered stalls seen in the photo below (bottom right), dating from about 1908. Ordering your book is as simple as clicking the PayPal button below. You'll be whisked off to our secure ordering form, where you tell us all about yourself. Books ordered through the website arrive at your door autographed by both authors, making this book the must-have, collector's item of the year. Get yours now. To order by phone, please call: 206 632-5813.